Gayton Thorpe is a small village, 2 miles from Gayton in West Norfolk. It is set off the beaten track and away from the main roads and busy life. The church nestles in the countryside on the edge of the village pond area. St Mary’s is a beautiful little church with a stunning Saxon round tower. You can read more about round tower churches here. 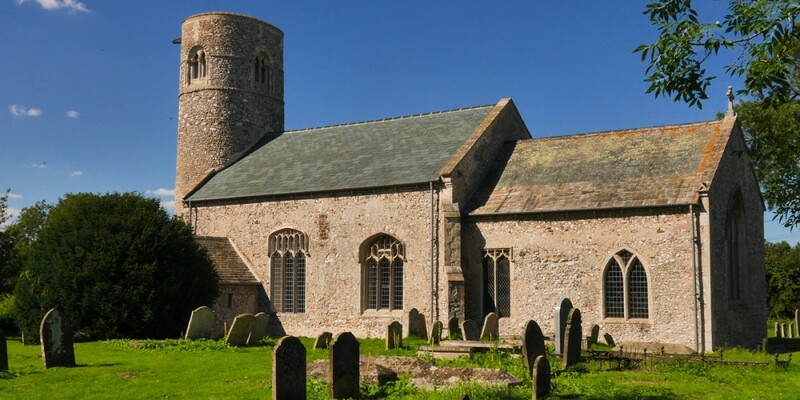 St Mary’s stands on the edge of two ancient tracks and walkways; one which leads across the fields to Soigne woods in Westacre and the other which is the Icknield Way, an ancient route for traders from the south east to the coast of Norfolk. Set against the background of one of the village’s ancient oak trees, at one time known by locals as the “Fat Five” (possibly referring to its main limbs), the village sign depicts the Saxon church. The ancient Icknield Way is shown wending its way past the church and the barn, farm gate and plough represent the agricultural heritage of the village. The figure of a Romanised Briton represents the Roman settlement, remains of which are located within the parish. Gayton Thorpe stands at the point where the old “Green Road” from Lynn to Norwich crosses the Icknield Way, which may explain why the parish occupies such a large geographical area in relation to its population.The presence of a substantial Roman building would have given the village even more prominence in earlier times. 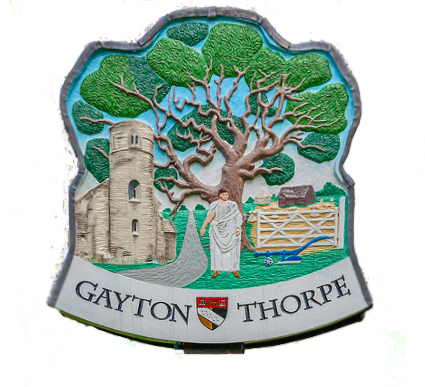 The people who live in Gayton Thorpe have a real pride in their village. The houses are partly stone and brick and have the warm terracota tiles of traditional Norfolk roofs. Villages have recently been successful in creating a very attractive play area for young children, with logs, swings and walkways. There are also aspirations to reorder the church to make it accessible as a community space for certain village events. Watch this space! The church is open all day and is a real haven at the end of a walk or just to visit for some quiet reflection.